Perception is a ( SF/mystery/romance) Young Adult novel that takes place in the not too distant future in a world changed by climate extremes, natural disasters and impending wars, and where scientific breakthroughs cause class divisions—both financially and philosophically. It explores the clash between faith and science and how differences can separate us as enemies or alliance us together. And in some cases, even in the midst of betrayal and personal crisis, there’s room to fall in love. This is the first book in a planned three book series. Read on for the first chapter of Perception! I balanced on my surfboard, right thigh burning and salt water stinging my eyes, while the best wave of the early morning carried me like a goddess on a pedestal to shore. My older brother Liam and I shared a friendly competition, and it gave me a certain, blissful satisfaction to catch the same wave and to get to shore first. “Beat ya!” I shouted over the noise of the crashing surf. Seagulls flocked and circled over us, squawking loudly, adding to the cacophony. Liam unzipped his wetsuit letting the top half fall down past his waist. He was in fine form, and I understood why all the girls raved about him. He was responsible for a long list of broken hearts. “I gotta get going,” he said, lifting his board. Jackson was my boyfriend but lately he’d been spending more time with my brother than he had with me. It was starting to tick me off. “What are you working on?” I rushed to keep up with my brother’s long, strong strides. He flicked his head, tossing the hair out of his eyes but didn’t answer. I stopped short shocked that he’d snapped at me. We resumed our trek along the beach, and I pushed back my frustration. Liam used to include me in everything. It was always him and me against everyone else. Him and me against Alison and Paul, aka our mom and dad. Him and me against the surf. We were a team. When did we start keeping secrets from each other? Rather, when did he start keeping secrets from me? I re-adjusted my board under my arm. Maybe I could get Jackson to unzip his lips. Especially if I helped him. He could be easily persuaded if I poured on the charm. I hated to go behind my brother’s back for information, but something about all this–this, whatever it was that Liam was doing–made me uneasy. I couldn’t pinpoint why, it just did. We reached our home, a massive glass box with two floors of windows facing the Pacific Ocean. It was built after the San Andreas Fault shifted and triggered the Big Quake that, along with the subsequent tsunami, wiped out ten miles of shoreline. A nearby white-stucco storage shed housed all our water toys. We stopped there to hang up our wetsuits to dry. I smiled in return. “No problem. It was fun.” Surfing with Liam was one of my most favorite things to do. “You’re back for dinner?” I asked. Liam didn’t know it, but once he left, I’d be spending the rest of the day preparing for his surprise birthday party. He’d turned twenty-one yesterday and had celebrated at a bar with his friends. I couldn’t go because I was underage, and it irked me that Jackson went and that he and Liam had once again shared a significant moment without me. I took consolation in the fact that Alison and Paul gave me free reign to plan this party. My heart beat with excitement, and I couldn’t wait to see his face when he got home and found the house full of his friends. “Yeah, I’ll be there,” he answered. Our property tiered twice before connecting with the sandy beach. Three glass doors slid open disappearing into the corner and creating a wall-less view of the stone patio that encased an eternity pool. Its waters slipped over the far edge into a waterfall that was collected again on the second tier. Liam strode into the house, through the living room and down the hall to his bedroom at the back, his wet shorts dripping on the glossy white tiles. I tightened the towel around my waist and climbed the open-slat staircase to my room. As I passed the maid, Saundra something, her brown face blanched. She stumbled slightly before grabbing the rail and catching herself. “Excuse me,” she said softly at my astonished look. The woman really didn’t look well, and I was thankful for my enhanced immunization. I was glad I didn’t have to worry about diseases brought in from the outside. She nodded weakly, and proceeded to clean the rails. I’d requested extra staff to get the house ready for Liam’s party. A trill of anticipation reclaimed my thoughts. I couldn’t wait for tonight. The door beside my bathroom opened into a second room, a walk-in closet big enough to house another bedroom set. Racks of clothes and shoes lined the walls, a well-lit mirror station was located near the sky light and a cushioned leather bench was placed in the middle for sitting. I stood in my closet and stared at the rows of sundresses, blouses and shorts. I settled on a lace blouse and cotton shorts, then went to take a luxurious shower, rinsing the sea water out of my long, blond hair. I leaned into the built-in seat that was designed specifically for my body height and shape. Laser lights mapped my head and twenty-eight silicon fingers reached out to massage my scalp while shampooing and conditioning my hair. Most days I had to watch or I’d doze off, but today I was excited. I commanded the water to turn off as soon as the rinse was done. When I was dressed and my hair combed out and tied back, I slipped my platinum Communication Ring onto my left middle finger. I tapped it which produced a holographic image of my phone apps on my palm. I touched the clock icon and holographic digital numbers appeared in the air. Ten already? Where did the time go? That was the thing with summer holidays; every hour ran languidly into the next. I imagined the cook and her crew were busy preparing for the party in the kitchen. I’d requested fresh sea food and simulated roast, fresh fruit and vegetables, an assortment of fancy chocolates and baked items plus a three-tiered, surfer-themed birthday cake. I skipped down the stairs to check on the progress, but in my hurry to the kitchen, I slammed into a body. “Sorry,” a male voice said. I stepped back agitated. I recognized the dark-haired boy wearing the white tunic my mother made the male staff wear. He was the maid’s son and I guessed he was part of the extra staff. He held a wet mop in his hand, and I figured he’d been cleaning up Liam’s spotty water trail. He stepped politely out of the way, but the expression on his face was stoic. Even though he was clearly from the outside and the help, I still expected some small sign that what he saw when he viewed me was pleasing. A twinkle in the eye, a slight upturning of the lips. These were the responses I got from all the boys. The straight ones, anyway. He wasn’t especially attractive but I didn’t see people with his appearance very often. He had eyes the color of imported coffee beans and skin like caramel candy. His nose was wide and his jaw-line sharp. I was suddenly intrigued by him and surprised myself by thinking he looked exotic. “Excuse me, what was your name again?” I asked. Right. I remembered now. I waited for him to say something, but he stayed quiet. Footsteps echoed from the hall above. My parents spoke together, their muffled voices floating across the high ceilings. “Do other maids send their sons to do their work?” Alison’s voice had a brassy tone that carried through the cavernous space. I felt a flare of red creep up my neck when I realized Alison was talking about Noah. My eyes darted to his, but he kept his averted. I was mortified. My feet felt cemented to the floor and I didn’t know what to say. Anything would come off as trite since nothing I could say could undo what Noah had heard. Noah’s jaw tightened and he turned his back to me. He attacked Liam’s dried and dusty water spots aggressively and soon had disappeared around the corner. “Zoe?” Alison click-clacked down the wooden stairs. She wore a pale yellow pant suit and high heels even though it was Saturday. She was in-between careers now, having spent the last fifteen years in law. She barely looked thirty years old and with lots of time ahead of her, she could do anything. Probably several things. “Mom! You have to keep your voice down. How many times do I have to tell you your voice travels in this glass box? I blew a frustrated breath. She could at least pretend she cared enough to remember details I’d told her a dozen times already. Things proceeded throughout the day as planned and I was pleased with my ability to pull off an event like this on my own. The decorators showed up at 1:00 as promised. The band arrived to set up at 3:00. I got dressed at 4:30, having bought a thigh-length mini-dress that sparkled with tiny crystals just for the occasion. My hair and makeup girl arrived at 5:00. I tapped my ring and called Jackson at 5:30. It was odd. No one in Sol City ever got really sick, but it wasn’t unheard of to get run down if you pushed yourself too hard. Jackson had been working a lot lately. Alison and Paul arrived at 6:30 along with all of mine and Liam’s friends. It was all a wasted effort. Lee Strauss writes science fiction and historical YA for mature YA and adult readers. She also writes light and fun stuff under the name Elle Strauss. As Elle Strauss she has written a lot of YA, including the Clockwise series, and the upcoming, Seaweed. Read my review of Clockwise! 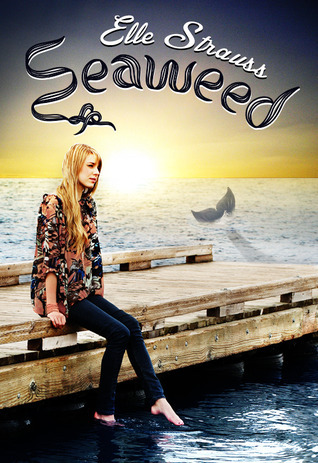 The Seaweed blog tour will stop by Speculating on SpecFic next week!